The New York Coalition for Healthy School Food held a fundraiser on Wednesday at the New York Academy of Medicine, a magnificent old medical library with engraved wood details, shelves of handsome book spines up to the ceiling, warm wood furniture, and moody lighting. Situated throughout the space, models glowed under spotlights, styled by designers in cutting-edge sustainable fashion. The crowd mingled, enjoying the fashion presentation, a silent auction, as well as delectable plant-based food and cocktails crafted by sponsoring restaurants and student chefs from Food and Finance High School. "Healthy Food in Fashion" was hosted by the infamous radio personality Robin Quivers, and by the end of the event, crucial funds were raised for their groundbreaking work on behalf of New York schoolchildren. Besides feting vegan treats from 24 vendors, the evening also showcased designers such as Tommy Hilfiger, Heather Mills, VPL by Victoria Bartlett, John Bartlett, Novacas for Brave GentleMan, Thieves by Sonja den Elzen, Olsenhaus, Angelrox, Cri de Coeur, DLC Brooklyn, Vaute Couture, GUNAS, and Study NY by Tara St. James. The models were all gracious volunteers, cast by model agent and activist Valerie Oula, with hair and makeup by a team of Aveda students under the direction of Eden Di Bianco, a cruelty-free hair and makeup artist and stylist. Healthy food for school kids is as much a no-brainer as an ethical and sustainable fashion industry. Healthy food for school kids in New York (and everywhere) is as much a no-brainer as an ethical and sustainable fashion industry. Both of these things seem like common sense, and even from the most selfish and purely economic perspective, these goals are about maximizing longevity, minimizing enormous expenses, and preventing major problems down the road. From a compassionate and revolutionary perspective, these ideals represent a cultural shift from one that prioritizes the cheapest and easiest profits at any cost to one of intelligent, careful, thorough, and compassionate planning that maximizes long-term well-being without compromising taste or pleasure. The NYCHSF is revolutionizing the way schools feed children. Traditionally, children are fed a highly processed, meat- and cheese-based diet that strongly resembles fast food. The NYCHSF is changing that by not only developing and introducing healthy homemade vegetarian entrees, but also by training cafeteria staff and management, school officials, parents, teachers, and children to focus on healthier, delicious plant-based food. Healthy food truly was in fashion at this amazing event! 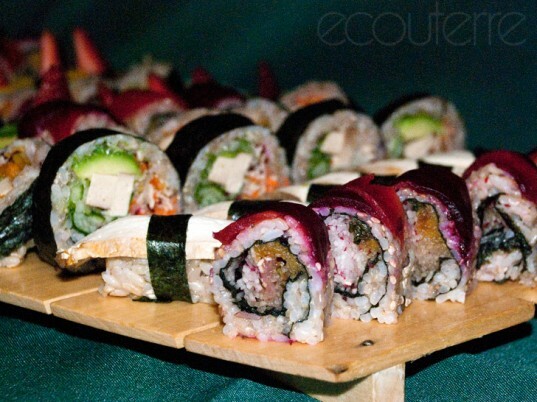 Ramasushi offered a fine selection of beautifully assembled, vegan sushi options. The art of sushi by Ramasushi. Veggiecation presented pumpkin hummus, fresh snap peas, and crackers with dip. Vaute Couture showcased two of its ethical, made-in-Chicago winter coats. DLC Brooklyn designer Susan Domelsmith (left) paired her jewelry with clothing by Study NY by Tara St. James. The Discerning Brute's Joshua Katcher (right) combined his sophisticated soles with apparel by designer John Bartlett. Tommy Hilfiger's bright, colorful line animated the formal library setting. Two looks from Imposter married glamor with fun prints. Executive Director of NY Coalition for Healthy School Food, Amie Hamlin, stands with her daughter who modeled a wrap-dress by AngelRox. Rebecca Johnson of Celebrevents organized the successful event. Ecouterre's own Yuka Yoneda and Jill Ferenbacher, along with GDGT's Peter Rojas, enjoy a healthy snack amongst the shelves of books. Veggiecation demonstrated several healthy, vegetable-based snack alternatives for kids and adults alike. Amie Hamlin and Russell Simmons pose with fellow gala attendees and supporters of the NY Coalition for Healthy School Food.